I've had the bergamot lime tea a couple of times and I quite like it, however, I may have a higher tolerance of sweeteners than you do. Lipton ice tea I only know with lemon taste and a few other sorts. Bergamot I've never tried before, but the taste I would like to try. 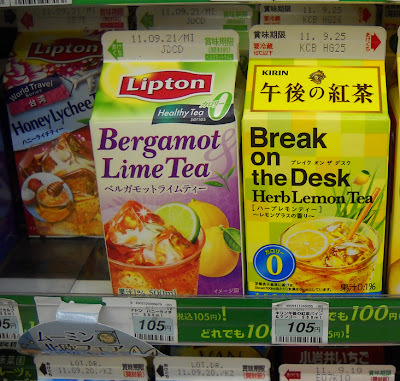 Helen: I'm remembering the disastrous Tea's Tea orange and bergamot that I had at Shinjuku Gyoen last cherry blossom season. I'm usually not so sensitive to artificial sweeteners, but it was abysmal. Perhaps I should give that a go though. Kelis: Lipton makes some really good tea in Japan, but sometimes it just tastes like Kool-aid with sweetener. My favorite is their milk tea.